Screenshot of candidates’ forum video courtesy of Kelly Brown. (APN) ATLANTA — Ten candidates–including the News Editor of Atlanta Progressive News–have filed declarations of intent to run in the March 19, 2019 Special Election for the Atlanta City Council District 3 seat. So far, three candidates–APN News Editor Matthew Charles Cardinale, Greg Clay, and Mrs. Shalise Steele-Young–have qualified. Qualifying period ends tomorrow, Friday, January 25, 2019. The District 3 seat has been vacant since the tragic passing of Councilman Ivory Lee Young, Jr. (District 3) in November 2018. Young had struggled for years with multiple myeloma, a blood cancer. 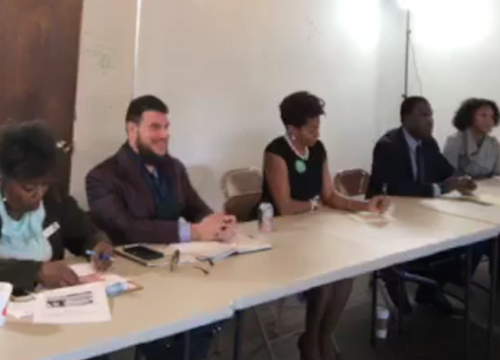 In order of date of declaration, the ten declared candidates are: Matthew Charles Cardinale, Greg Clay, Patricia “Granny P” Crayton, Shalise Steele-Young, Ricky Brown, Erika Estrada, Antonio Brown, Mesha Mainor, former Councilman Jabari Simama, and Atlanta Public Schools Board of Education Member Byron Amos (District 2). Yesterday, the Atlanta Journal-Constitution published an article choosing, negligently, to only cover the candidacy of Mrs. Young, blatantly ignoring the existence of other candidates in the race. Because of this unfair coverage by the AJC, Atlanta Progressive News has decided to take the extraordinary step of venturing to fairly cover the race, even though APN’s News Editor is in the race. In addition to running Atlanta Progressive News, Matthew Charles Cardinale has been an advocate for the people of Atlanta for over thirteen years. He has drafted some fourteen progressive ordinances and resolutions that are now law in the City of Atlanta. He drafted the ordinances–for transparency, public input, affordable housing, due process for small businesses, and protecting the First Amendment–and then gave them to various Councilmembers for introduction. Cardinale has fought to bring transparency to the Atlanta City Council. In 2012, the Georgia Supreme Court ruled in his favor, bringing an end to secret votes in the City of Atlanta. In 2013, after two years of litigation and advocacy, Cardinale caused the Council to open their closed-door Committee Briefings to the public. Cardinale has drafted a 180 Day Plan that includes fourteen draft ordinances which, if elected, he would introduce for affordable housing, the environment, criminal justice reform, a municipal bank study committee, and local democracy. Cardinale lives in the Hunter Hills Community. Greg Clay previously ran against Councilman Young in 2017, receiving approximately 33 percent of the vote, while Mr. Young received 67 percent of the vote. Clay has served in several administrative positions in city governments. He was recently a Customer Service Manager for the City of College Park. According to social media postings, Clay is being backed by David and Suzanne Guy Mitchell, the brother and sister-in-law of former Council President Ceasar Mitchell; and Courtney English, the former APS BOE Member. Clay lives in the Atlantic Station neighborhood. Patricia Crayton is the President of the Board of Directors of People TV, Atlanta’s public access television station. Crayton previously ran against Councilman Young in 2013. In addition, she ran for the Atlanta Public Schools Board of Education Seat 7, an at-large seat, in 2017, getting into a Run-off with Kandis Wood Jackson. Wood Jackson won the Run-off Election. Crayton lives in the Dixie Hills community. Steele-Young is the widow of the late Councilman Young. She is the founder and Executive Director of Repairing the Breach Ministries. She lives in the Vine City community. Ricky Brown previously had been running in the 2017 District 3 race against Councilman Young, but was disqualified due to a prior drug conviction involving the Magic City nightclub. Fulton County posted notices at District 3 precincts in the 2017 race that Brown was disqualified. A convicted, ex-felon, Brown has dedicated his life out of prison to helping former inmates to secure employment. He runs a company called Next Step Staffing. Brown lives in the Castleberry Hill neighborhood. Erika Estrada is a certified CPA who has started her own accounting business. Estrada serves on the board of directors of the Initiative for Affordable Housing, Inc., which provides services to homeless people and operates 355 units of affordable housing. Estrada lives in the Castleberry Hill neighborhood. Antonio Brown is a fashion designer and entrepreneur who founded the LVLXIII fashion brand (pronounced “Level Thirteen”). LVLXII shoes and garments are sold by the Nordstrom department store and other retailers. Brown has also focused on community service, working to teach high school students how to become entrepreneurs. Brown lives in the Atlantic Station neighborhood. Mesha Mainor is a PhD candidate in Human Services, with a specialization in Nonprofit Leadership; and is a licensed physical therapist. She said at a recent forum that she has taken a leave of absence from her career to focus on running for City Council full-time. Mainor lives in the Hunter Hills community. Former Atlanta City Councilman Jabari Simama is running for the seat he held previously from 1987 to approximately 1995. As previously reported by Atlanta Progressive News, Simama was fired as the President of Georgia Piedmont Technical College in 2018 for gross financial mismanagement. Simama disputed the Board of Regents’ statements about his termination in an interview with Crossroads News. He threatened to file a defamation lawsuit, but no such lawsuit appears to have been filed. Simama also previously ran People TV, had a column in Creative Loafing magazine, and served in the City of Atlanta’s Office of Communications. Simama’s wife, Nisha, previously served on the APS Board. Further, it appears that Atlanta Public Schools Board of Education Member Byron Amos (District 2) is aiming to run. He was the last to declare, and attended a candidates’ forum. Amos, if he runs, would be the instant favorite of the political machine of former Mayor Kasim Reed, Reed’s brother Tracy Reed, and current Mayor Keisha Lance Bottoms, according to sources familiar with the matter. Bottoms is looking for a solid vote to replace Mr. Young, who had been a consistent vote in favor of administration projects like The Gulch. Amos served on Mayor Bottoms’s Transition Team. Also, when the School Board voted to approve additional oversight of the Tax Allocation District, Amos was one of only two APS Board Members to oppose the additional oversight in a December 2018 vote.